New York Sen. Kirsten Gillibrand is introducing a bill to expand health care coverage. But as WXXI's Brett Dahlberg reports, she knows it's probably not getting through the current Congress. Sen. Kirsten Gillibrand is introducing a bill to expand health care coverage, she said. 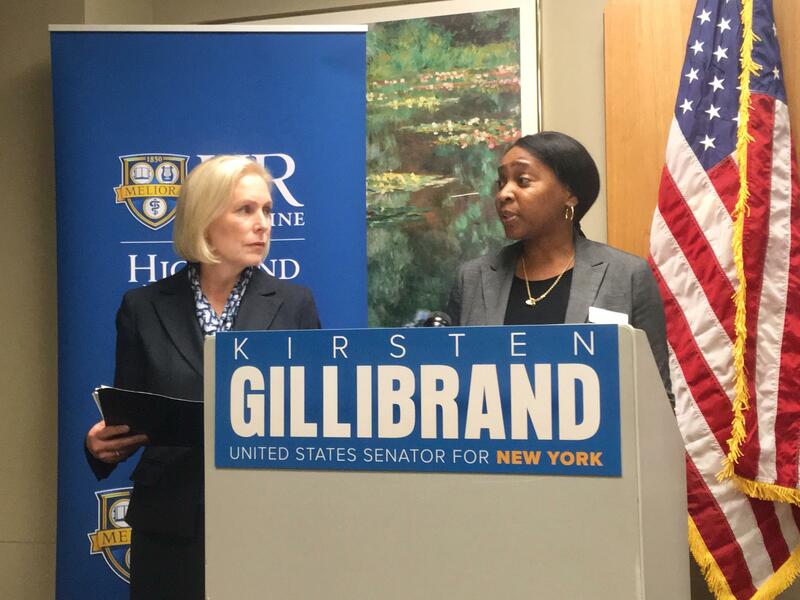 At a press conference Monday at the University of Rochester Medical Center’s Highland Family Medicine Clinic, Gillibrand said the bill would raise the cap to qualify for federally funded basic health programs from twice to four times the federal poverty line. Sen. Kristen Gillibrand, D-N.Y. looks on as Candace Lucas, director of St. Joseph's Neighborhood Center, speaks at the press conference where Gillibrand announced a new bill to expand federal health care coverage. Gillibrand, D-N.Y., contrasted her bill with what she said are efforts by the administration of President Donald Trump to reduce government health insurance coverage. “Health care is still the No. 1 issue no matter where I travel in New York, and unfortunately even in the New York delegation, you have members of Congress who voted for Trumpcare,” Gillibrand said. The bill would make basic health care available to more people whose incomes are too high to qualify for Medicaid. Those people are often employed but still can’t afford quality health care for themselves or their families, said Candice Lucas, director of St. Joseph’s Neighborhood Center in Rochester. Her organization helps people without health insurance pay for medical care, she said. Screenings for some cancers, for example, are covered by insurance that meets the minimum federal requirements, but treatment for cancers found during those scans is not, Lucas said. That puts people in the untenable position of choosing between debt and medical care. Basic health care would help cover those treatments, Lucas said. New York is one of only two states taking advantage of the current legislation that provides health care to people who make up to twice the federal poverty level, Gillibrand said. She expects expanding the number of people covered would entice more states to use the federal funds. “I think if we were able to do that in all states, then no one would have to fall through the cracks of not being able to afford basic health care,” she said. Still, she acknowledged, the bill is probably not going anywhere unless political control of Congress flips to Democrats. The bill’s passage isn’t possible “without changing the players list,” she said.